Sylvain Chomet’s The Illusionist is based on a script written by Jacques Tati, which he had kept in a drawer until his death in 1982. It tells the story of a past-his-prime stage performer, who is forced to accept questionable engagements in dubious venues in order to make a living. When he performs in a remote Scottish village, he meets little girl Alice, who is convinced that his tricks are truly the result of magic, and she follows him to Edinburgh. Delighted by her enthusiasm for his art, he rewards her by ‘conjuring up’ ever more generous presents, ultimately allowing himself to be bankrupted by the constant giving. 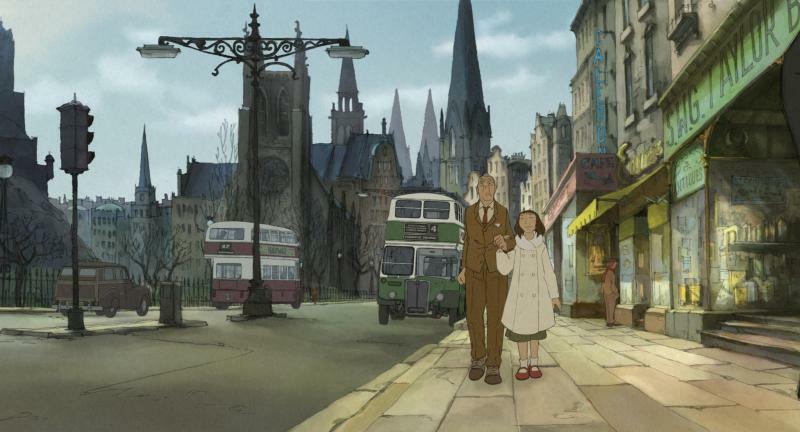 But while The Illusionist is stunning to look at, it is a little more unkempt when it comes to the story it wants to tell and the story that’s behind this quite remarkable pairing of Tati and Chomet. Pamela Jahn took part in a round table interview with Sylvain Chomet at the Berlin Film Festival in February, where the film had its world premiere before opening the Edinburgh Film Festival in June. Q: Can you tell us a little bit about how you got hold of the script, because there seems to be some controversy over it. Sylvain Chomet: No, there has been no controversy at all, but some very bad journalism was done in the UK. When I was working on Belleville Rendezvous I contacted Jacques Tati’s daughter, Sophie Tatisheff, to seek permission to use a segment of Jour de F&#234te in the film. To get her authorisation we showed her the material, small clips we had ready at the time and the script of Belleville Rendez-Vous, and she really liked it. All this rang a bell, and she remembered she had this script from her father. She knew that it was connected to her, because it is obvious that it is a letter from a father to his daughter. Tati wrote the script over quite a long period, three or four years, and Sophie was 13 when he started working on it, so he saw her change into a woman. She gave us permission to use the clip from Jour de F&#234te and she mentioned the script, but that was it. She died shortly after our conversation and so, unfortunately, we never met her. One day I contacted the estate of Jacques Tati, Jerome Deschamps and Mikall Micheff at Les Films de Mon Oncle, and they passed me the script – and I fell in love with it. I really loved the simplicity of the story and this very strong, beautiful relationship between father and daughter. It also felt very close to my relationship with my own daughter, who was five years old when we started the film and who is now 17. We bought the rights to make the film and Deschamps and Micheff were both very happy with it, so there is no controversy. But as you mentioned before, there has been some discussion in the media about the script and your film. I received a letter from a man called Richard MacDonald, who said he was the grandson of Jacques Tati. He told me the story that Tati had met someone at the Lido in Paris during the war and she became pregnant with a little girl. But Tati was married at the time, and he didn’t want to take responsibility. After I received this letter I decided to meet with this man, because I was interested in the details of this story. But when we met he became very aggressive and accused me of provocation and all that, and I said: ‘Look, if you are telling such a strong, emotional story about a father and a daughter you have to live with your daughter, you have to experience that. And that’s why I don’t see any reason why this script should have been dedicated to this girl he never lived with and who he didn’t see growing up.’ So I told him that if he had any problem with that, he should go speak to the estate of Jacques Tati. And he went off and I never saw him again. Then one day, there was this article in The Guardian saying all these terrible things about the film by a person who had never actually seen it. Was there a moment when you worried about adapting this script because of the pressure of using the work of a distinguished director like Tati to make your own film? There were two driving forces for me. One was Sophie, his daughter, but not because the script was all about her, rather because the story is about this father figure who is seeing this girl growing up like his daughter and who is trying to tell her something about life. When I read the script for the first time, I thought I should do something with it because otherwise it would have not gone anywhere, because Sophie Taticheff didn’t want this to be filmed in live action. She didn’t want somebody else to play her dad’s role in the film. And the other thing that was very important to me was that it was a very different film compared to Jacques Tati’s other work. I think if he had made the film at the time his career would have taken a completely different direction. The film takes place over a long period of time and in many different locations, and there’s a lot of travelling, which is all very unusual for Tati. So for that reason, because it wasn’t another Monsieur Hulot, I thought it would be really nice to do it. And the challenge for me was to make the script and all the emotion that’s in it work in animation. Do you think Tati would have approved of an animated film? I don’t know. I knew he was fascinated by drawings, and I think he was quite frustrated that he couldn’t draw himself. And in his films there is always a strong connection to childhood. If you look at the end of Play Time, for example, the world he describes in the film is very ugly. It’s sad, it’s grey, it’s uniform, almost robot-like. But at the end, you have this beautiful scene with the carousel of cars and it all becomes very childish. I think that is a beautiful way of looking at life. He’s got a lot of this in his films, like the relationship with the little boy in Mon Oncle. That’s why for me the ending in The Illusionist is not sad. It’s an evolution, I’d say. Father and daughter are both going their separate ways. She’s young, from a different generation, so she’s going to live her own life within her own culture. And he is an old man, but he’s also going to carry on and do something else. And I think it’s actually very redemptive when they meet in the end. But to answer your question, I don’t even know if I would have wanted to meet Tati to get his approval. Because most of the time when you have heroes like that it’s actually better not to meet them! Why did you decide to include a live action scene with Tati in the film again, as you did in Belleville Rendezvous? I felt I needed to put it in there so he could have a little look into the film. So you have the animated Tati and then you have the real Tati, like a mirror, and they look at each other and say ‘Do you want to stay?’, but they say ‘no, no, no’ and they leave. I think he needed to be there, if only for a moment. The film is very different to your previous work. Yes, exactly. Belleville Rendezvous went extremely well and a lot of people came to me and said: ‘Oh, are you going to make another one like this, this was really nice’, but I didn’t want to do that. I wanted to do something completely different. And here was the challenge, because this script wasn’t made for animation, it was made for live action, but I was convinced that it could work. I read the script when I was on the train to Cannes. The film is a voyage also, and I felt that it had something to do with the gentle balance of the train. I think I needed Jacques Tati to help me be a bit simpler in the way I use the camera and things like this. But that said, it was amazingly difficult, because nothing is more complicated than trying to do things very simply, and to make them look simple. Was it also a challenge, or rather an attraction, for you to do something in 2D at a time when everything is going 3D? Yes, but this was also a problem for us, because most of the really good animators are into 3D at the moment. And a 2D animator needs to know so many more things than 3D animators, because 3D basically means you have puppets without the strings, it’s a virtual world, so you have to be good in volumes and sketches and make them move. But a 2D animator is someone who can draw ‘classically’, who can draw fast, and someone who knows anatomy. You need to know the motion of animals and humans to make it work, and you need to know how to act as well. How do you think children see your films? I’ve never aimed my films at children as the main audience. I think you restrict yourself when you do that. But on the other hand, I was very surprised that a lot of kids actually watched Belleville Rendezvous, and they all loved it. My own daughter, for example, was never forced to watch the film. She actually has a lot of Pixar movies at home. But one day she saw the DVD and asked if she could watch it and she loved it too. For kids, I think, it’s all real… A lot of people are still fascinated when they see animation. It’s magic. No controversy over the script? Depends who you listen to and only if Sylvain Chomet is so arrogant that he is blind to history? Read the historically accurate account of what inspired Tati to write the script for The Illusionist by Tati’s grandson, Richard McDonald over on Roger Eberts Journal. The true history of the dark regretful script was also published last month in the Telegraph newspaper in the UK. Chomet must be indulging in some very kooky time distorting substance abuse if he can’t work out that Sophie Tatischeff was nine when Tati first wrote the script for The Illusionist. Every biography ever wrote on Tati gives the script’s first date as 1956! According to Pathe’s promotional material for the movie the script wasn’t even held by Sophie Tatischeff it was held by the French Movie archieve. What sick game is Chomet playing? Neither the original script or Chometâ€™s movie reflects anything of the privileged early life Sophie Tatischeff had whilst it clearly connects to the harsh reality of the life of her elder sister Helga Marie-Jeanne who it would seem survived on tenacity and luck alone whilst never knowing the love of her father. In 1950â€™s Tati was a financially successful Oscar winning film director who was able to go and self fund Franceâ€™s most expensive movie in Playtime. Riches enhanced by Tatiâ€™s inherited Russian aristocracy roots that were to indulge his family the most luxurious life that would sharply contrast that of his eldest daughter who would spend much of her young life in boarding school. The story of The Illusionist is a story about a girl discovering a quality of life she had been deprived by a father who was never able to love her as he knew he should have. Sylvain Chomet gaffs again, for years he has been spinning the tale that Sophie Tatischeff personally gave him the script for The Illusionist now he blabs he bought it from the people who run Tatiâ€™s estate long after Sophie had died having never met her. Having watched this story unfold Chomet appears to be in need of an ointment for his itchy pants. Jacques Tati was not married when his first and eldest daughter was born in 1942 and it was she, Helga Marie-Jeanne and not Sophie who was thirteen years old when the script was first conceived by Tati. It was written by Tati to appease his guilt that he had felt towards his neglected first child. What is Chomet hiding from or trying to conceal with the miss telling of the origins of Tatiâ€™s script and what benefit is there in spitefully denying the only living family of Tati the manâ€™s attempt at resolving a private matter between a father and his daughter? Does Chomet really believe that the man who delivered some of the most charming comedies, often through childhood observations, would be so crass as to write a script for his younger daughter without having feelings of guilt for his eldest child he had treated so unkindly and whoâ€™s life the script actually mirrors? I think I may have to agree with Rachel on this one. I too have read varying accounts from the man (Chomet) himself as to how he came by the script, rangeing from it having been bequeathed to him in Sophie Tatticheffs will, to him having glanced upon it in the French film archives, or down behind the back seats of an old ford cortina. Okay, so I made the last one up, but this nonetheless doesn’t deter from the fact that in every account Chomet has given has been different everytime. And now, apparently he bought the script from Tati’s estate. Could it be that we are finally edging somewhere towards the actual truth here Mr. Chomet? As much as i enjoy Chomet’s films, i have to say that he is not short of arrogance. In the ‘special features’ section of the ‘Illusionist’ dvd, he vehemently slags off ‘Scottish Enterprise’ for not supporting him in his plan to establish his studio in Edinburgh. In fact, ‘Scottish Enterprise’ gave a thumbs-up to Chomet’s request and offered him ‘premises’ on the ‘outskirts’ of Edinburgh, but Chomet rejected the support, stating that he wanted the studio to be based in the centre of Edinburgh. Furthermore, he goes on to slag the quality of students attending Scottish art schools, and blames ‘Scottish Enterprise’ for him losing out on funding for a previous film venture, which was eventually made in a London studio. Who does Chomet think he is? He has no right, artistic or otherwise, to expect his demands to be honoured from another country’s funding resources. He should be humbled by the offer from ‘Scottish Enterprise’. If i, as a foreigner, requested support from French funding agencies and snubbed ‘them’ because ‘they’ didn’t agree to a portion of my demands, ‘they’ would have my head on the chop. Chomet’s arrogance knows no bounds. Provence can keep him while he continues on his journey to becoming an ungracious, bitter old man.